Jay Peak is a mountain in northern Vermont. Many people from Canada ski there, and the mountain has a well-deserved reputation for getting a lot of snow. These things alone should make you want to go there. There are challenging trails, awesome in-bounds glades and plenty of potential for exploration. The weather is notoriously fickle: it can be really cold and windy, moderately cold and dumping snow or somewhere in between. Really cold and windy, for the uninitiated, means a very real danger of frostbite, with wind chills pushing -40, which is the same in both Celsius and Farenheit. So, bring warm clothes. Skiing at Jay Peak is a bit of an adventure. 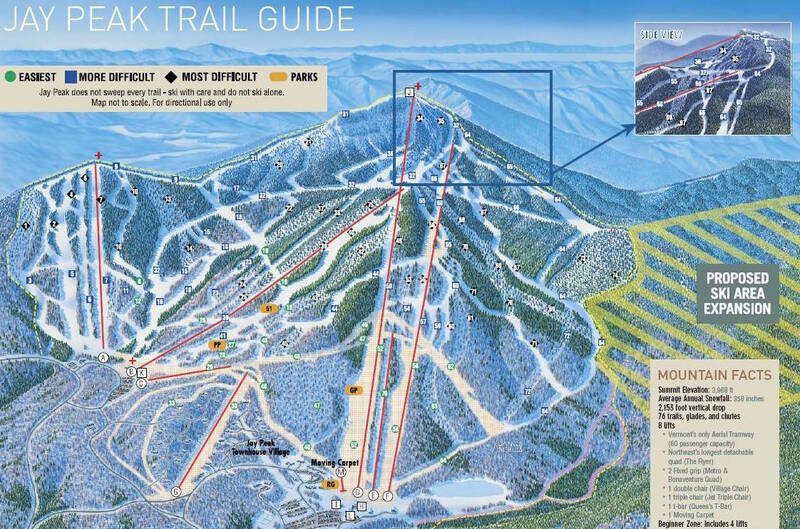 Lately, Jay Peak has been in the news because of rapid infrastructure development, funded in part by the EB5 program. In the last five years alone, new construction has produced an ice arena, an indoor waterpark, two completed new hotels, expansion of condo development, a number of new restaurants, a spa, a Disney-themed beginner snowboard park, a “mountain learning centre,” a wedding chapel, a third hotel underway and, uh, oh yes, one short new lift. First-time visitors seem pretty impressed with the “new” Jay Peak. The kids can hang out in the waterpark if the skiing bores them, Grampa can go curling at the Ice Haus and Dad can talk trash with the guys in The Foundry while Mom shreds the pow. Or something like that. Long time regulars are divided, though most seem to be coming to terms with the new amenities. For now, at any rate, the skiing is still what draws people to Jay Peak, even if the year-round attractions keep vying for attention.